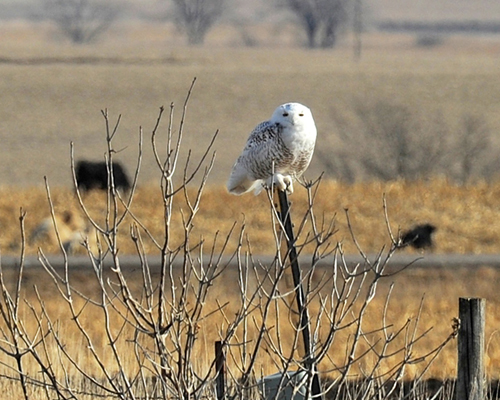 First reports of Snowy Owls are being made in Minnesota. Sightings are few and scattered. There is no indication that this will be an invasion year similar to 2013-14. That winter we had hundreds of Snowy Owls in Minnesota. One owl in particular received a lot of attention. It was named Ramsey, after the community one the northern edge of the metro area where it spent weeks. Ramsey was very popular with photographers. Eventually, Ramsey was captured, and equipped with a very light backpack that allowed researchers to learn where and when the owl went. These backpacks collect and store data via satellite, unloading via cell phone whenever the bird moves within cell-phone range. The data collectors have been significantly improved in the last four years. In addition to tracking precise geographic movement, the data packs also log altitude, flight speed, air temperature, and acceleration speed, Altitude and flight-speed can be logged every six seconds, previously unheard-of detail. The data loggers are powered by sunlight. Yes, dark arctic winters are a problem. The machines store collected information until a cell-phone tower download is possible. Researchers have waited months for an owl to stray close enough to a tower to report. Some owls were silent for so long they were presumed dead, resurrected at the ring of a phone. The organizers of this crowd-funded citizen-science project now have 70 owls so equipped. Information never before available about the lives of these birds is being studied and published. This past summer, juvenile Snowy Owls were tagged before they left their nest in Alaska. For the first time, activities from the day the birds fledge will be available. The effort is known as Operation Snowstorm. It includes over 40 researchers, banders, veterinarians, and other experts from across North America. For the most part, these people are volunteers. The project is supporting a Ph.D. candidate at McGill University in Canada who is using collected data to examine Snowy Owl ecology. 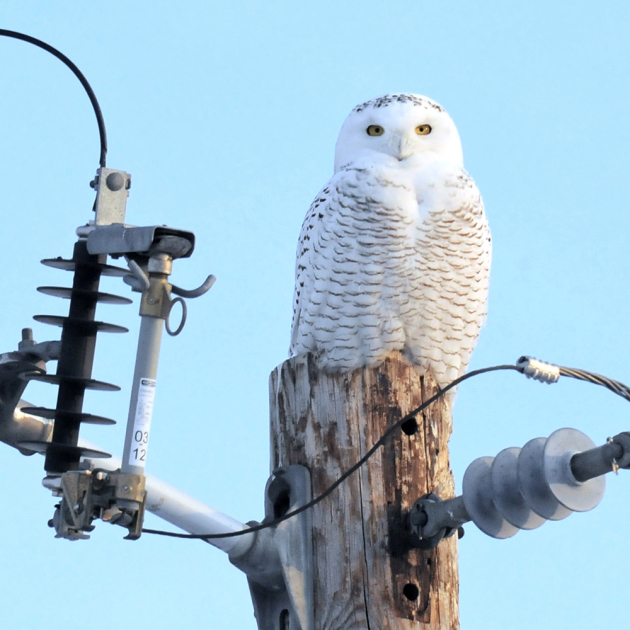 One thing learned is that are far fewer Snowy Owls in the world than previously thought. The population once was estimated at 280,000 birds, a healthy number. Now, it is believed to be closer to 28,000, a number of concern. These are Arctic birds, breeding on land above the tree line. The changes being made on Arctic land by ever-increasing air temperatures is a concern. Land currently suitable for owl nesting is changing. This research project is established here and in Canada. It will be expanded to include Greenland and Europe. 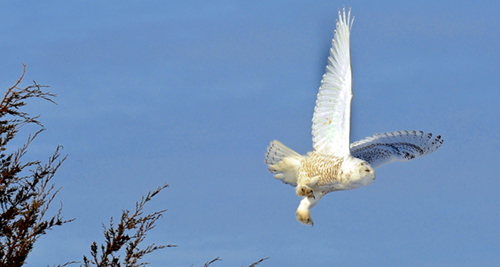 Snowy Owls are transpolar birds, their territories circling the North Pole. More information can be found on the Operation Snowstorm web site: our website. Donations are necessary to continue this research. 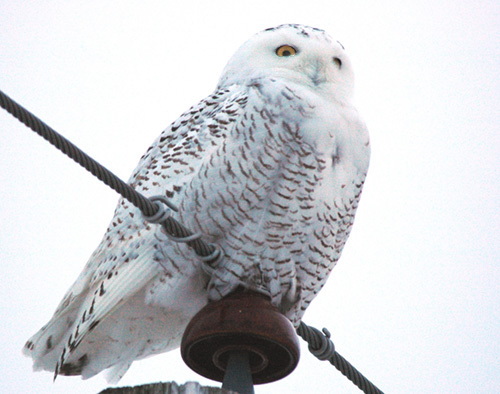 When traveling in out-state Minnesota look for Snowy Owls atop poles or haystacks or roofs. They seek flat land, just like home, so an observation vantage point often is sought. There is no way to predict location. Owls simply appear.